snowdeal.org > ex machina: the eric update - day 318: odin and the other guy. a self portrait. the eric update - day 318: odin and the other guy. a self portrait. today was a slow day - the perfect kind of day for hanging out on the back patio, wondering when it will be warm enough to "open" the pool. and i guess as good a day as any for a self portrait with odin. which is not exactly the easiest thing to do when all you have is a 50mm lens on your camera and no tripod or remote shutter release; regardless, i love the fact that it looks like we're both wondering if i'm ever going to snap a picture that's in focus and doesn't cut one or the other of us out of the frame. it appears that odin doubts that it'll ever happen before his bedtime. and is it just me or does it appear as if we have identically furrowed brows with a slight squint to the eyes? What a little trooper you have there. kim: " Just wanted to say Hi, from a reader all the way over in New Zealand. Im due any day with my first baby and stumbled upon you photos and site, I have spend the last 2 days reading all about you :-)"
keep us posted on your immanent entry into parentdom! You are both adorable! You both have that same serious face. I totally agree with the furrowed eyebrows and squinty eyes! Now we know where Odin gets his good looks. Hi! (from Louisville, KY) I stumbled across this site when Odin was only a few days old. I found myself coming back everyday to see how he was doing and have kept coming back since. It's really amazing to me, a stranger, to see how far along he has come. You seem to appeal to a wide audience. I'm only 19 but I love children. I plan to go into teaching so development of children is fascinating to me. Odin is such a cutie. It's not just you. 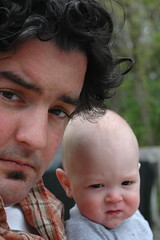 If the child had dark curly hair and a soul patch, he'd be your mini-me. I kid not. rachel: "Well, just thought I would stop lurking around and say hello"
hello rachel! thanks for commenting and i'm happy to hear that you've been enjoying the site for quite some time ( hard to believe it has been almost a year! ). pumpkinhead: "It's not just you. If the child had dark curly hair and a soul patch, he'd be your mini-me. I kid not."